O'Connor was Kerry's 2015 All-Ireland-winning captain, while Irishman and former Blue Zach Tuohy, from Laois, is also on Geelong's list. Kerry prodigy David Clifford rejected AFL recruiters' overtures last year and was the subject of county great Tomàs Ó Sé's criticism targeted at Kennelly's role in prising away Irish young guns. The Kerry Gaelic Athletic Association (GAA) has also formed a committee, on top of the booklet, to develop ways to retain its most promising sportsmen, according to the Irish Independent. County board chairman Tim Murphy conceded at a Kerry convention this week that the amateur association could not compete with the riches available in professional sport. "The AFL and their scouts continue to be a challenge not only for us here in Kerry, but for the GAA as a whole," Murphy reportedly said in his address. "The committee specifically dealing with this issue will continue in their endeavours to ensure that all other players considering a move are given the benefit of choosing an attractive alternative to remain here at home. "The lure of professional sport will continue to be a huge challenge for us." The Kerry booklet focuses on alerting athletes about employment opportunities and helping facilitate them, as well as informing players about training and educational courses. http://AFL.com.au previously reported that a limited number of Gaelic football stars earn about 50,000 Euro ($AU80,565) through sponsorship. They can receive the equivalent of double that once combined with work or study opportunities. GAA players also receive 65 cents per mile travelled for their inter-county involvement, as well as a monthly nutrition allowance and a small state grant in recognition of their community contributions. But they pale in comparison to AFL wages. Last year's AFL collective bargaining agreement increased the average player wage from $309,000 to $371,000, while Irish footballers start on slightly more than the standard rookie wage of about $75,000. 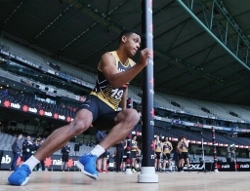 Four Irish prospects from the Combine will come out to Australia in April to try to further their AFL ambition. Six of the 14 Irishmen in the competition signed this year: Okunbor, James Madden (Brisbane), Mark Keane and Anton Tohill (Collingwood), Callum Brown (GWS Giants) and Red Óg Murphy (North Melbourne). The others, outside of the Cats trio, are Hawks Conor Glass and Conor Nash, Essendon's Conor McKenna, Sun Pearce Hanley and Sydney's Colin O'Riordan. Nash told an Irish podcast in November that there was a "case" for GAA clubs to be compensated financially when an AFL club recruited them.